We got in touch with James Colligan, who occasionally answers some of the complaints about bookvip.com online, and turns out he's a real person who really does own bookvip.com. After some back and forth he did get us a refund. I still wouldn't recommend doing business with these people unless you are very very patient and very flexible about where you end up on your vacation. Getting our money back was more of a hassle then it should have been, and of course we'll never get back the hours of frustration we spend trying to sort this out. Oh well, at least we'r not out the $1000. Lesson learned. We booked a one week stay in Cancun at Sandos Plyacar. They started out lying to us about when the card would be charged. They said it wouldn't be charged for 7 days and charged it immediately. 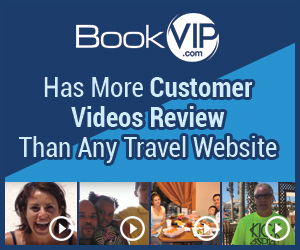 One week prior to our departure we had heard nothing from Book VIP. Not confirmation letter, nothing. After multiple phone calls messages and email, none of which were ever answered by them, we finally got ahold of a live person and were told they could not get us reservations there. We asked for a refund and were flatly denied. They only give a 7 day refund period. The trick is they do nothing for you during that period so they don't tip you off as to how much your being scammed. Once they safely have you money, then the bad news starts to come in. Our only option, less than a week before our vacation was to change resorts to Villa Del Palmar. This just happens to be one of their 'featured' resorts. In other words, the one that pays them the most for lining up suckers like us. We didn't like the resort, it had nothing we were looking for and didn't want to go there, but we had to agree, they gave us no choice. We were later to learn that they knew they couldn't get us into Sandos Plyacar from the beginning, but waited till the last minute to tell us, I assume to put pressure on us to do what they wanted.They referred us to their web site for information on Villa Del Palmar. It states the 4 a la carte restaurants, room service, in room mini-bar and top shelf liquors are all included in the package. It still says this. We spent the entire week before our vacation on the phone, mostly on hold with these people. We left numerous messages and emails, none of which were ever returned. Finally, 2 days before we were leaving they sent us a confirmation letter. It stated that none of the restaurants, the room service, the in room bar and the top shelf liquor were included in our package. We were expected to eat at the buffet 3 meals a day for a week. After hours more on hold and screaming at them to talk to a supervisor- they really didn't want to let us! They sent us another confirmation letter that simply erased the line about the restaurants not being included. No other changes, looks like someone just used white out on it. We called the resort and were told that no, nothing had changed in our package, we would treated as second class citizens for our entire stay, but of course we'd also have to endure their timeshare presentation anyway. At this point we had been told so many lies by the people at BookVIP and endured so much truly terrible customer service that we had simply lost all faith in them. I don't know if they are totally incompetent, or just crooks, but it really doesn't matter. We dared not risk our vacation, who knows what other lies they had told us we wouldn't find out about until we got there and had no where to go? When we cancelled our reservations the resort told us that no monies had been paid to them and there was no penalty for cancellation because we were within the 48 period. BookVIP still refused to give us our money back. They claimed we had a verbal contract to change resorts. However a verbal contract based on false and misleading information, which their web site is full of, is not binding. I have since found out that their claims to be members of IATAN, ASTA and have an A+ rating with the BBB are all lies as well. These people are shameless! Review #591117 is a subjective opinion of dreadpiratk. i do apologize we werent able fulfill your vacation request. Like any growing company we are not 100% perfect and always working to improve and an as owner I will do everything to resolve an issue like yours. We are always looking to improve our service and we do have an A+ Rating with the BBB. I still wouldn't recommend doing business with these people unless you are very very patient and very flexible about where you end up on your vacation.